Muthiah Muralidaran 723 Not Out ! 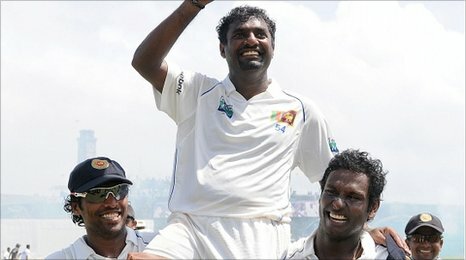 Muttiah Muralitharan finally became Test cricket’s most successful bowler today, marking a new high for one of the most controversial players in the modern game. The off-spinner bowled Paul Collingwood on the third morning of the first Test to claim his 709th wicket and surpass retired fellow spin great Shane Warne’s world record tally of 708. Congratulations Murali from us all – awesome.